Learn how to easily customize your BeTheme powered website by visually editing each element. You'll just need to install and activate the CSSHero WordPress plugin. Muffin Group’s BeTheme, the biggest WordPress theme ever, is a multipurpose theme that ships with over 220 pre-built websites. The theme’s functionality and design quality set it apart from the competition. Built on a fully responsive framework and featuring a wide range of integrated layouts, BeTheme enables webmasters to have a responsive WordPress website up and running in minutes! BeTheme packs Muffin Builder 3, Slider Revolution, LayerSlider, and Visual Composer giving you more options than ever before to create high-end websites from the get-go. With over 60,000 users raving about its features and customizability, this one of a kind theme leaves little to be desired. The theme features two base grids – full width and boxed – and three different layouts – left sidebar, right sidebar, and dual sidebar – for users to mix and match to create a powerful structure for their site’s content. BeTheme offers 20 customizable header styles that webmasters can upload logos to, change fonts, set colors, resize, and much more. The Muffin options panel makes for a robust back-end which you can leverage to modify your theme, manage your website, and execute any administrative tasks. The super-charged admin panel makes it easy for webmasters to maintain their WordPress websites without having to code a single line. CSS Hero on BeTheme allows you to take the theme’s default customizability to the next level. Alter typography, try out tons of different backgrounds and modify page elements to match your business’ brand with our dynamic, high-powered plugin that’s geared towards helping you live edit your site without getting into its code. Comes with a one-click demo installer. Responsive and retina ready display for improved user experience. Powerful Muffin Options Panel for easy back-end management. Fully customizable featuring Muffin Builder paired with Muffin Options Panel. 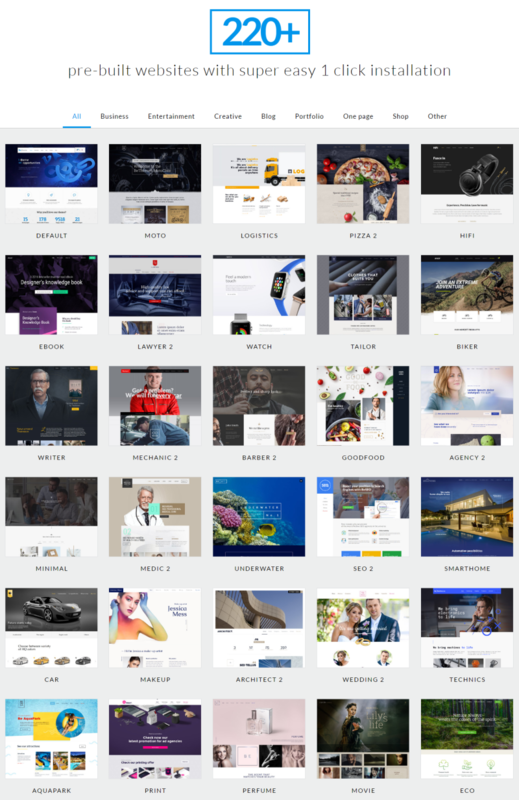 220+ website templates to pick from. Over 200 shortcodes to ease the designing process. Features a built-in mega menu, one-page design, parallax effect, and video backgrounds. One-click skin generator for a truly unique site that matches your brand. Custom widgets and unlimited colors, menus, and Google Maps to pick from. Ships with a pre-made child theme. Offers lifetime updates with each license. Optimized for speed, multilingual-ready, and cross-browser compatible. Navigate to Appearance > BeTheme Demo Data from your site’s dashboard to access BeTheme’s vast array of pre-integrated templates that feature a one-click demo content import functionality to get started without any hassle. The theme comes with demo styles for Business, Entertainment, Creative, Blog, Portfolio, One Page, Shop, and Other categories. BeTheme has over 220 templates for you to choose from! Once you’ve picked out a theme template to go with all you have to do is replace the demo data with your own. You can also choose to implement the default layout, import demo content for pages, posts, and custom post types, import menus, options, and widgets. 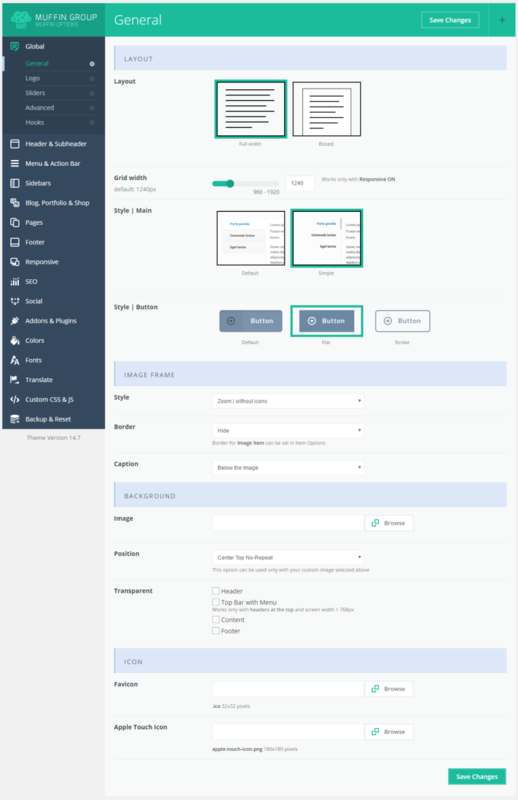 BeTheme’s built-in Muffin Options Panel enables webmasters to manage their site’s design and functionality with ease. You can customize everything from your theme’s headers to its menus and the SEO settings to the social settings – it even lets you create backups. Theme management at its best! The Global tab has options for selecting your site’s layout, grid width, styles, image frame, background, and icon. You can add a logo, make it sticky, and configure its height, padding, and alignment directly from the options panel. It’s theme management at its best! Although BeTheme does pretty well in the customization department it doesn’t offer live editing. With CSS Hero, you can modify just about every page element of your website from the front-end and preview the changes live. CSS Hero on BeTheme is a definite yes!